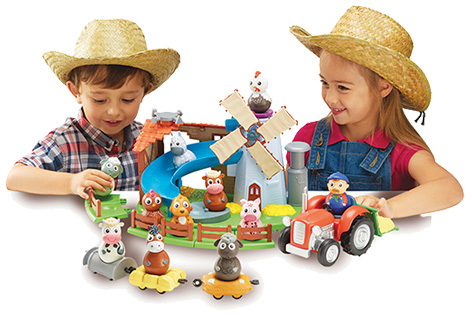 Joining the ever popular ranges of Weebles toys and playsets is the hero product known as Wobbily Farm Mill & Barn as part of the Weebledown Farm collection. This great toy is packed full of fantastic play value and creates a new twist on playing with all the kids favourite farm animals. Forming part of the Weebledown Farm collection, kids love playing with Fluffy the Sheep, Dapples the Horse or even Nugget the Chicken. Featuring the famous weighted base that gives all the Weebles characters such appeal, these farm animals enjoy spending all day wobbling in the fields of being taken for a ride in the Wobbily Tractor. This vehicle can also tow the Wool Sack, Milk Churn or Hay Bale trailers that each has a space for an animal to ride along as well! This playset also features a barn building as well as a windmill and an exciting slide. Please tell us what you think of the Weebledown Farm by Character Options.